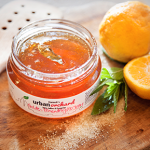 My products are handmade from fruit, cane sugar & water only. 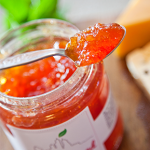 No commercial pectin, preservatives, colourants or additives are used. Only the good stuff. No bad stuff. The fruit I use are grown by passionate people for the love of it. Sourced from urban gardens and picked from neighbourhood trees, it provides the growers - mostly pensioners and elderly people - with a source of income and a sense of pride. Each jar therefore is unique and variation adds charm. I hope the sweetness of our orchards brings joy into your home. My mom is visiting us here in America at the moment and brought us some jam made by my sister-in-law Hanneli. I thought I would be positive of her attempts regardless of the truth, but was I pleasantly surprised!!! Here in America, we are able to buy an array of jams in the store, but her jams can compete any day! !It was a treat getting a taste of home in the choice of fruits used. I hope my mom will bring us some more when she comes to visit again. 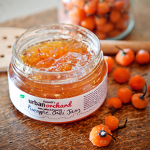 Urban Orchard home produce is a stunning idea. 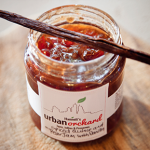 Not only are the jams (the pineapple-chili jam is my favourite) delicious, but the idea of good food coming out of urban gardens and an urban kitchen is awesome! It tags on brilliantly to the worldwide movement of slow food – even in an urban environment. You don’t have to move to the country to taste it! Well done to the creator, Hanneli le Roux and the very best of luck!